In reflecting on my experience with this tumor, I kept coming back to the idea that love played an integral role both in my diagnosis and recovery. I realize I am not alone in knowing the importance of love. Perhaps, it was a loved one who implored you to see a physician to obtain a diagnosis; maybe your loved one makes sure to attend all of your appointments; love and support can be as simple as holding your hand during difficult times. For me, I remember first trying to leave my wife out of the situation, believing being tough meant being a lone ranger; in reality, there really is no such thing as a ‘lone ranger’, even the Lone Ranger needed help (from Tonto). When I realized that the diagnosis was a grim one, I had to telephone my wife to have her by my side when I received the diagnosis. When I was waking up from my anesthesia after my 16-hour surgery, the first person I apparently called for was my older sister. 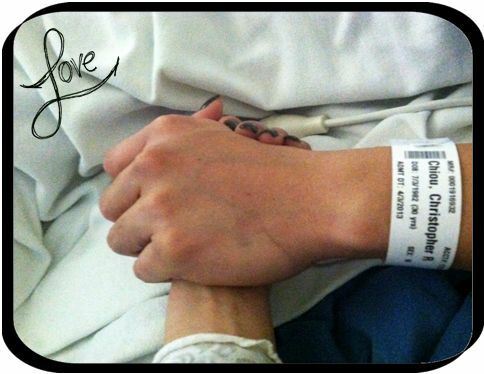 When I was transferred to the ICU I remember holding my younger sister’s hand. My mother spent every night with me in my month and a half long stay in the hospital. Why do I tell you this? Why is this relevant? I am like anyone else, and when the chips were down and I was shoved into a corner, I instinctively called for loved ones. Like I said, I am like everyone else; my nature to want loved ones by as I faced difficult situations is an instinct that we all share. I then thought of the idea of love, and its role in my ordeal: I realized that love not only got me a diagnosis, but it has also helped me through my recovery. The neurologist who diagnosed me reached his conclusion out of love; love for the art and skill of his profession. I was promptly seen at the University of Michigan because those who loved me quickly called and found the top neurosurgeon in the area. Every card, every visit, which brightened my day was done out of love. With health issues like epidermoid brain tumors, we all need loved ones to help us traverse this terrain. Whether you are a ‘wait and watch’ patient or have upcoming surgery scheduled, the idea of love is how we get through this. Even though the thought of love may immediately place your mind in the realm of the traditional sense of the word, love can come in many forms; yes love of a fellow human is the more ‘traditional’ thinking behind the emotion, but we can (and do) love more than just people—we love places, arts, and professions too. I do not tell you this to tell you how lucky I am to have those around me who love me, but to remind you that every relationship you forge, every loved one is a person you should cherish. It’s easy to be with a loved one during times of joy, but remember it is those same people that will also be there when you are down.